They say that a picture speaks a thousand words, and I suppose what you see above is pretty much self explanatory. After all, you simply cannot get any zanier when it comes to footwear that with a pair of $39.99 Horse Hooves. 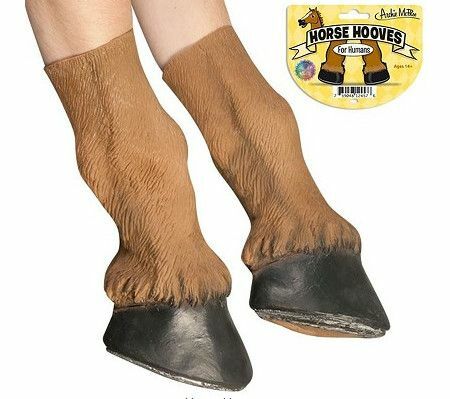 Wearing these would definitely do their part to complete your transformation to being a full blown horse, and I am quite sure that dressing up as a centaur would be a definite option later this Halloween. The Horse Hooves happen to measure 14” in length, and will be able to fit most hands out there for an extremely unique effect. It’s going to be crazy, I tell ya!